In a nutshell, a letter of intent informs the recipient about the intentions of the writer, but the contents of these documents vary greatly depending on their specific purposes. You may need a letter of intent that states your goal of gaining admittance to a certain school or program. 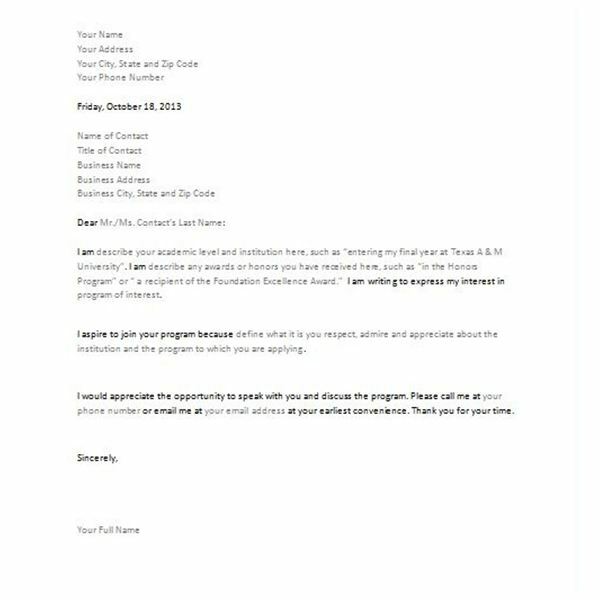 Your letter of intent might notify a foundation that your non-profit organization seeks funding. An entirely different type of letter might state your intentions of purchasing a piece of real property. If you know which type of letter of intent you need but are unsure about how to create it, you can download one of these templates for Microsoft Word and customize it to your unique situation. Before applying to a university, you may need to submit a letter of intent. Make an effort to determine to whom you should address this letter rather than using a general “To Whom It May Concern" salutation. Open the letter by introducing yourself, presenting your positive attributes and display your interest in the institution. Close with a request for contact to help initiate further conversation. This template includes labeled fields into which you can type your name and address, the school’s address block and other contact information. A date field updates automatically when you open the template, as well. Labeled fields throughout the letter explain what to write about in each section, helping you create a custom letter of intent that provides the necessary information. Grants are essential to the success of many non-profit organizations, but grant writing is a lengthy and laborious process. Some foundations require letters of intent to precede a proposal, but even if it is not required, a letter of intent informs the potential benefactor that you plan to request a grant and also allows you to request information that will help you in the grant writing process. 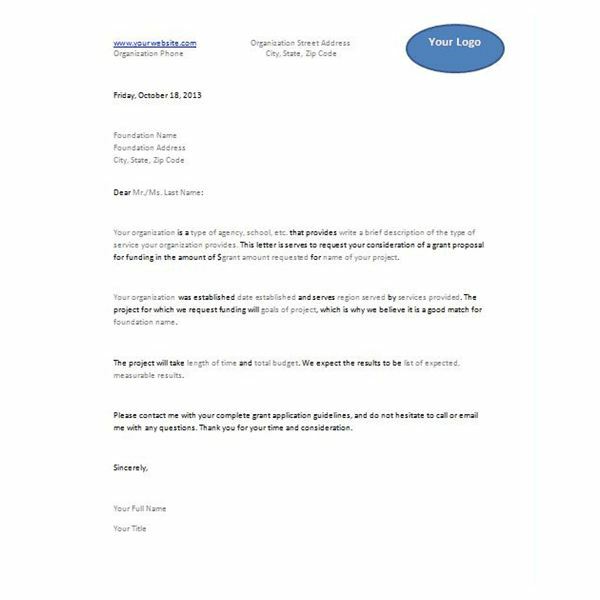 This template includes a letterhead, which you can modify by accessing the header. In Word 2007 or later, select the Insert tab, click Header and choose Edit Header. Replace the sample text with your organization’s contact information and logo. Fields throughout the letter template prompt you to enter information about your agency, the people you serve and the grant you plan to request. A real estate letter of intent is not a contract or binding agreement, but rather an outline of the terms of a potential real estate transaction between two or more parties. 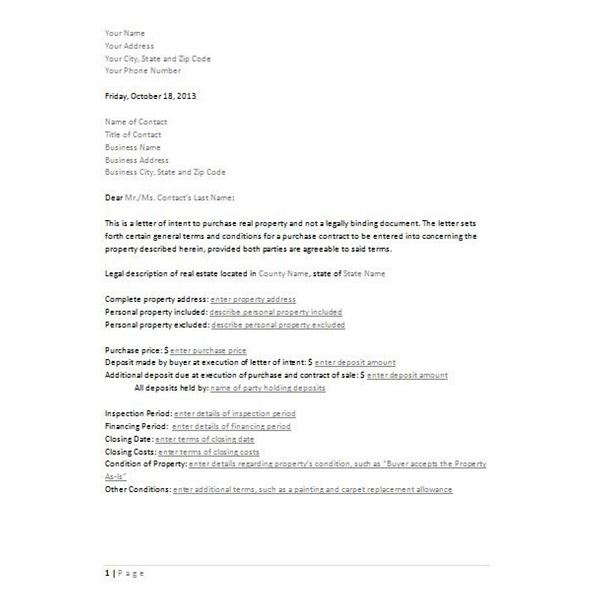 This letter of intent template prompts you to enter important information, including both parties’ information and property specifications; financial details, such as the purchase price and deposits made; the time frame for the inspection period, closing and other considerations; and signature sections for they buyer and seller. This template includes a page number in the footer, which you can change or remove by selecting the Insert tab, clicking Footer and choosing Edit Footer. Each template is in .dotx format, which is compatible with Word 2007 or later as well as Word 2003, provided you have installed the Compatibility Pack.